Whether it’s a baseball mitt, homemade banner, giant foam finger, beer helmet, or a dead octopus, people like to bring stuff to sporting events to enhance their enjoyment of the game. 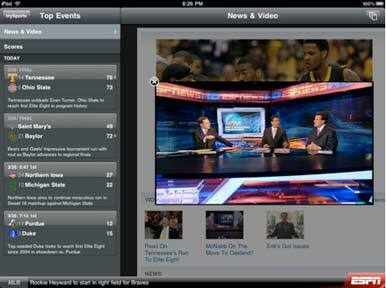 You might want to add an iPad running ESPN’s new ScoreCenter XL to the list. 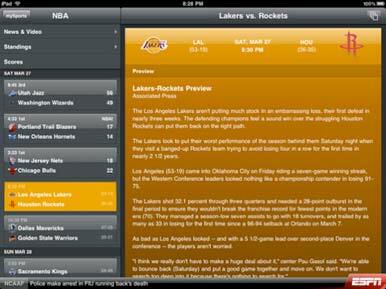 Released on Wednesday, ScoreCenter XL is an iPad version of ESPN’s ScoreCenter ( ) for iPhone. If you like to track scores from other games while you’re watching a game, an app like ScoreCenter XL could be a scoretracker’s dream. The app provides full box scores of the day’s games and live statistical updates. Sure, you’re probably already doing this with an iPhone, but the iPad’s bigger size makes it easy to navigate the ScoreCenter XL app. You don’t have to be as tightly focused on the iPad as you have to be on the iPhone, allowing you to be more attentive of the action around you. ScoreCenter XL's myTeams feature allows you to quickly access information on your favorite teams. myTeams has news feeds, scores, and videos. If a game hasn’t started, you can read a pregame analysis. You can set ScoreCenter XL to open to the myTeams feature when you launch the app, giving you immediate access to your preferred teams. To help keep you on top of what’s happening, ScoreCenter XL has push notifications. You’ll get notifications when a team scores, at game breaks, and when a game ends. ScoreCenter XL is $5 and requires iPhone OS 3.2 or later.